We personally produce all our own products, at our UK manufacturing base. MDF is one of our best selling materials, particularly our moisture-resistant MDF range, which is ideal for use anywhere in a building, as it combats damp and moisture for a greater life. However our hardwood range is preferred by some customers, depending on the environment and style of the property you wish to fit our products into. The elegant Lambs Tongue Skirting design can be manufactured in either a 3050mm (10ft) length, or an extended 4200mm length, supplied exclusively by us. However please allow 5 to 7 days for delivery, if you require the 4200mm length. All our 3050mm MDF boards are 18mm thick, and only £6.95, allowing for £2.28 per metre, an incredibly low value for such high quality boards. All our products are cut using superior quality carbide cutting knives for an extra smooth finish, making it even easier for you to prime and paint. Alternatively, you may even choose to let us prime your products, so they're ready for painting with a top coat of your choice, as we love to save you more time and money. We manufacture both MDF and hardwood architrave sets, ready to fit around your door frames. Our standard sets comprise of two lengths; 2 x 2440mm lengths for each side of a door frame, and 1 x 1220mm for the header architrave. 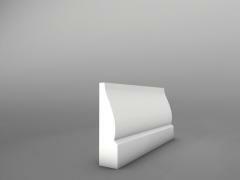 However an extended length architrave set is also available, of 4200mm as shown above. Our MDF architrave sets are both available in either standard or moisture-resistant grades. Our hardwood architrave sets, are superior quality, and available in a variety of different woods; European Oak, Sapele, Oak, Tulip and Ash, all finished to perfection. Remember perfection takes a little time, so please allow 7 to 14 days delivery for our hardwood selection. We ensure all our hardwoods are sourced from a sustainable resource. This elegant designs hardwood boards are only available in a standard 3050mm length, however are still available in the variety of woods mentioned above, once again finished to perfection with an extra smooth finish, using superior cutting knives. A 68mm sample is available for just £1.67, and will give you a better perspective of how this design would be portrayed, around the top of your boards and door frame. 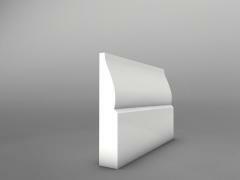 Please to take a look at our Modern Lambs Tongue skirting range, also featured here on our site. It is a design with greater moulding detail, at the top of each board, and along the edges of the architrave, if your looking for a more intricate design.